The classic flavors of bagel and lox, but in a higher protein, lower carbohydrate bowl. Gather the essentials like lox, cucumber, red onion, and capers and arrange over a base of our kefir cup for a combination that satisfies your bagel cravings. Extra @traderjoes everything bagel spice is mandatory. 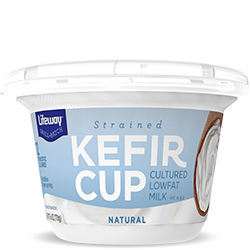 In a medium bowl, combine kefir with lemon juice, green onions and everything bagel spice. Spoon equally into two bowls. Top with cucumber, red onion, capers and lox. Top with more everything bagel spice and serve with bagel chips and lemon slices.